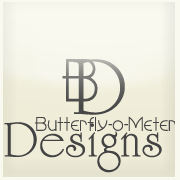 Butterfly-O-Meter Designs helped me set up a blog button and new design, I'm really happy with it-though I think I will try incorporating a little more of my old design into this one. I hope you all like this new look as well! I love it! It's super great! It looks awesome! Very sweet and cute.